I don’t even remember exactly how it got started. I know that we had a group of undergrads that joined the lab in Fall 2012. Jenna Lang and I were trying to find a project where we could try having undergrads do a 16S study. I’m not sure how aquariums came up, but somebody had heard that they were setting up some new saltwater aquariums on campus. “The perfect study system!” we thought… we could study succession through the process of setting up these aquariums until they reached a stable state. Through various trials and tribulations we collected hundreds of samples… starting when the tanks were totally empty, through the process of adding sand, sediment, heaters, coral etc. I have a particular memory of the moment when I realized that starting a project with daily sampling right before Christmas Break was perhaps not the best plan. I remember Christmas Eve, Christmas Day, and New Years Eve sitting alone watching water filter while all the undergrads were off on break. The samples were the easy part though… it’s all the metadata (twice a day to start) that was so much work. We tried to measure everything we could think of that might affect or be affected by the community succession… pH, hardness, temp, phosphorus, nitrate, nitrite, ammonium, oxygen etc. The undergrads did PCR after PCR for months and months, but one by one people graduated or moved on to other things. Luckily Alex Alexiev stayed in the lab and powered through the remaining hundreds of extractions and 16S library preps. Originally we collected water, surface wipes, and sediment but we didn’t get enough consistent DNA from the surface wipes and so ended up dropping that part of the study. A few MiSeq runs later and we were in business. It took a few years to analyze the data and get a paper written but it’s finally out as “Microbial Community Succession and Nutrient Cycling Responses following Perturbations of Experimental Saltwater Aquaria“. In a nutshell, we found replicable patterns of community succession between the two aquariums we sampled, even though the setup timelines and conditions were not identical. 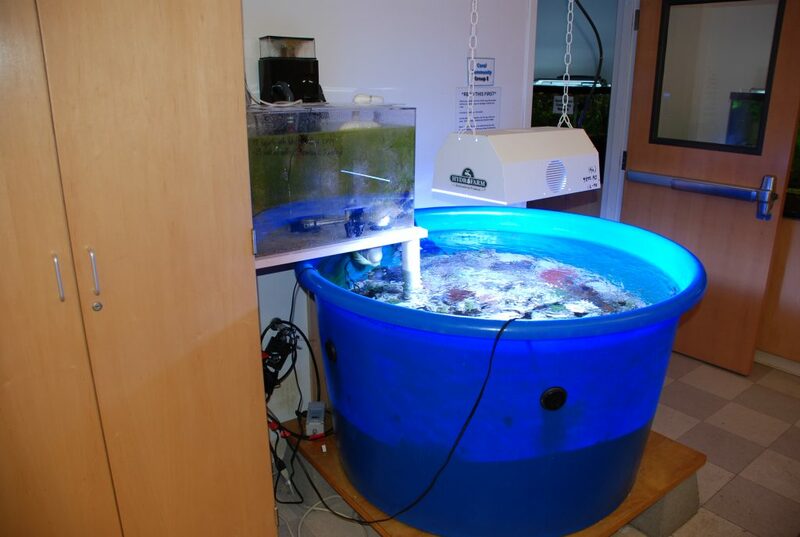 We were able to study in detail the changes in the bacterial community in response to various perturbations… mostly importantly the addition of sediment from an existing tank and the addition of “live rocks” to the system (both common practices in saltwater aquariums). In particular we found interesting changes in the microbial community occurring in parallel with big shifts in nitrogen cycling in the system. We also report, for the first time to our knowledge, the presence of anammox bacteria in aquariums.